Ahh...That bean bag is certified! 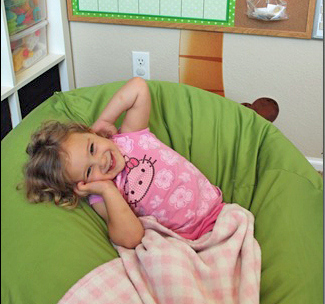 We introduced our eco-friendly organic cotton bean bag chairs in 2009. Back then there weren't any bean bags that we considered to be stylish, practical, comfortable, and organic. Believe it or not, that still holds true to this day. Our organic bean bag furniture is the first to market that, in our opinion, hits the mark in every way. Stylish: 11 different colors to choose from, like our popular lime green, hot pink, yellow, and blue. Practical: Fully removable, machine-washable organic cotton cover. Inner water-repellent liner that holds the filling safely inside while the cover is being washed. Child-resistant zipper that unlocks and relocks to keep kids out while allowing parents access to the filling. Comfortable: Buttery soft cover. Polystyrene (Styrofoam) pellet filling that offers comfort and support. Remember, our covers and liners do NOT have flame retardants (except "Kinetic Energy-plum" covers). Ok, now...Let's talk in depth about the organic side of things. Ahh! Products uses 100% organic cotton twill to produce the covers of our organic bean bag chairs. 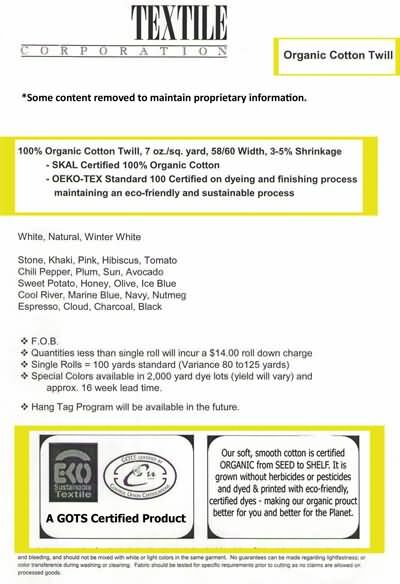 The cotton fibers are SKAL and GOTS certified. The dyeing and finishing process is GOTS and OEKO-TEX Standard 100 certified. From our fabric mill: "Our soft, smooth cotton is certified organic from seed to shelf. It is grown without pesticides and dyed & printed with eco-friendly, certified dyes. This makes our organic product better for you and better for the planet." In organic farming, the way crops are grown must have a low impact on the environment and harmful chemicals cannot be used. Cotton seeds cannot be treated with pesticides or insecticides, so growers must use different solutions. For example, in India where much of our organic cotton comes from, seeds are often covered in cow manure. Manure's fungicidal qualities work on keeping bacteria under control. Instead of artificial pesticides with harmful chemicals, organic farmers grow "insectary plants" next to cotton fields. These plants attract harmful insects and help to lure them away from the cotton plants. Helpful insects, such as Trichogramma wasps and Coccinelid beetles (lady bugs) are also used to keep harmful pests under control since they are natural predators. Herbicides are replaced with manual weeding. Picking is also often manual so the use of heavy, wasteful machinery can be reduced or eliminated. Natural fertilizers are used on cotton plants. Growers use special plants that naturally increase and manage nitrogen levels in the soil. The "green" manures used are totally natural, so non-organic fertilizers are not necessary. To till the land, conservation tillage is used. This means there is less plowing and soil disruption, which reduces erosion and increases the amount of water the soil can retain. Organic processes also work to use less energy, less water, and should produce minimal to no harmful emissions nor pollution. It uses 50% less fossil fuels than conventional farming. Now that's eco-friendly! Certified organic cotton farming also prohibits the use of genetic engineering (GMO), irradiation, sewage sludge, toxic and persistent pesticides and fertilizers. Fun fact: Conservation tillage has reduced the United States' carbon dioxide emission equal to taking 27,000 cars from the road! Once the cotton is harvested, producing organic cotton fabric is similar to that of non-organic cotton in terms of the technology used (ginning, spinning, weaving, and dyeing/finishing). However, organic cotton has strict rules that govern these processes. Organic cotton must be kept totally separate from conventional cotton, and the various machinery used to gin, spin, weave, and dye/finish are cleaned to avoid contamination. In the dyeing and finishing processes, only substances that meet organic standards are allowed. These substances should be biodegradable and environmentally-friendly. For example, "low-impact fiber-reactive dyes" are often used because they are absorbed better by cotton, thus creating less wasteful runoff. Plus, they don't contain toxic substances. Ahh! Products uses cotton that is certified by SKAL, OEKO-TEX, and GOTS. SKAL is a non-profit foundation that inspects and certifies harvesting and production methods following EU-Regulation (EEC), number 2092/91. SKAL ensures that products named "organic" definitely come from an organic production process. Based in the Netherlands, SKAL is under the roof of the Dutch Ministry and is recognized internationally as an organic standard. SKAL is a member of IFOAM and EOCC, the European Organic Certifiers Council. OEKO-TEX Standard 100 tests finished fabrics for carcinogens (cancer-causing substances), heavy metals, formaldehyde, and potentially allergy-causing dyes. First introduced in 1992 in Austria, OEKO-TEX Standard 100 labels textiles that have been proven to be below a limit for certain harmful substances. Only fabrics that meet their criteria carry the label "Confidence in Textiles". Certification must be renewed yearly, and can only be received after successful laboratory testing. 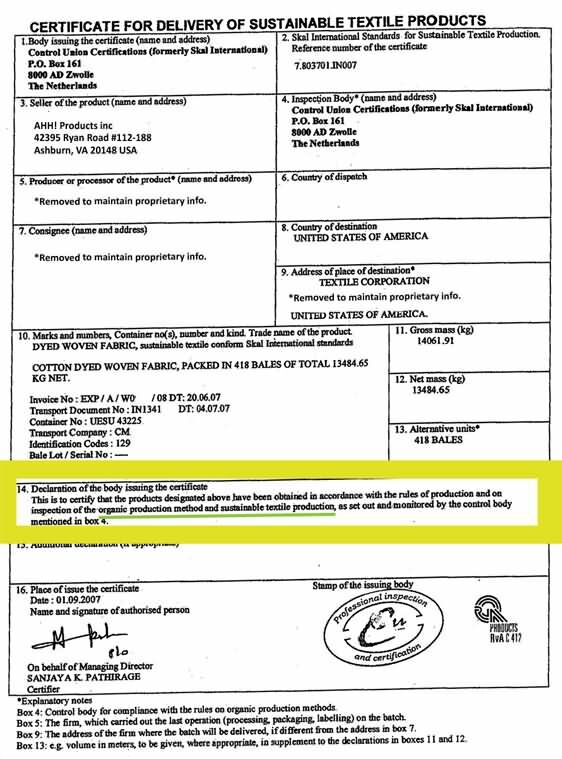 Textiles are tested for substances such as formaldehyde, pesticides, extractable heavy metals, and preservatives such as tetra and pentachlorophenol. The textiles are also tested for banned carcinogenic dyes and dyes that are known to cause allergies. Fabrics must have skin-friendly pH levels and good color-fastness. GOTS stands for "Global Organic Textile Standard". For a fabric to be GOTS certified, the fibers must be at minimum 70 percent organic. The dyes and finishing substances used must pass GOTS requirements on toxicity. GOTS also looks at how waste is processed. Plus, GOTS ensures that human rights standards are followed both at the cotton fields and the dying facility. production, as set out and monitored by the control body mentioned in box 4 (Control Union/SKAL)." 1. Consumers get a healthier end-product without harmful chemicals. Relief for many that suffer from allergies, making it hypo-allergenic. 2. Low impact on the natural environment during production/growing and processing. 3. Good working environment for workers, both in terms of human rights and the substances they are exposed to. 4. Less energy and water used. Less or no pollution. Ahh! Products is proud to be among other top brands that offer organic cotton products, such as Nike, Levis, Patagonia, and Target. By producing eco-friendly organic bean bags, we hope to help our customers and the environment for generations to come. Please do not hesitate to contact us with any questions at 703-298-7516 or email us at beanbags@ahhprods.com.